The on-topic help page and corresponding off-topic help page are pretty vague, lacking a lot of specific things that would cause their question to be closed as off-topic. 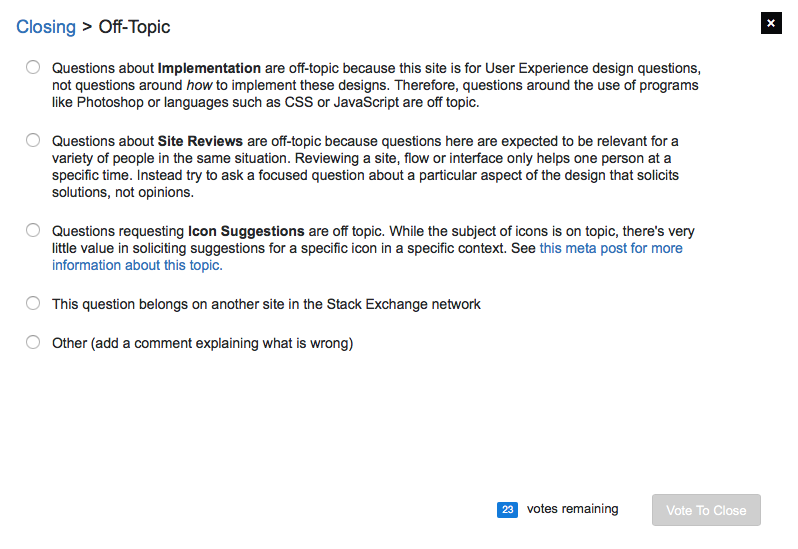 If a user had an implementation question and they weren't sure if it was on-topic for this site, they wouldn't find anything nearly as explicit in the help as the text we see (the word "implementation" doesn't appear anywhere in the help pages), so there's a good chance the first time they find out that it's explicitly off-topic is when their issue gets closed as such. Similarly, site reviews are called out specifically here, but they're not really listed on the off-topic page. Ideally, the entire content of each of these points would be copied to the off-topic help page at least. It would help to make this guidance available (or more discoverable) in the mobile app. All of my interaction is via the iPhone and iPad apps and I expect that is the case for many users. In theory, yes I would agree that the Off-Topic help page isn't as useful in a specific sense for new users. However, the On-Topic help page is the only one that we can edit - the Off-Topic page you linked to uses global copy. It's exactly the same on all Stack Exchange sites (such as on https://physics.stackexchange.com/help/dont-ask or on https://bicycles.stackexchange.com/help/dont-ask) and is uneditable by mods. Which does kind of make it difficult to inform users up-front what is specifically off topic here. Not the answer you're looking for? Browse other questions tagged discussion on-topic off-topic help . What will our Blog be about? Something for the (quiet) weekends - clean out the clutter! Edit “Icon for X” questions not too localized to visual metaphor requests and reopen? Earning points for suggested edits: Is it broken or does the Help page require editing?